The AS3693A is a 16 channels high precision LED driver with built-in PWM generators for building backlight panels in LCD-TV-sets. External clock and synchronizing inputs allow the synchronization of the LCD backlight with the TV picture. 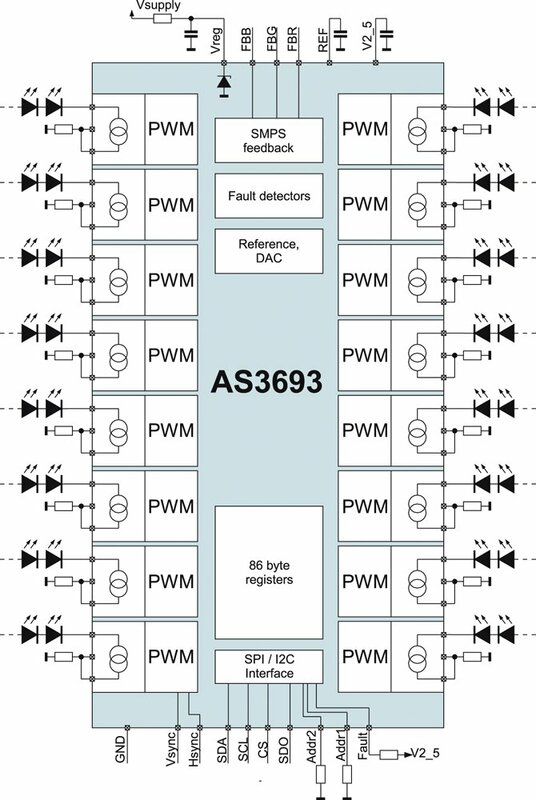 Local dimming and scan dimming is supported by 16 independent PWM generators with programmable delay, period and duty cycle. Three free configurable dynamic power feedback circuits make the device usable for white LED as well as RGB backlights. Built-in safety features include thermal shutdown as well as open and short LED detection. All circuit parameters are programmable via I²C or SPI interface.